Originally a Queenscliff fisher – went to Adelaide for Crays. Sold to Rye fisherman and systematically pulled apart over 15 years – she was a garden kids ‘Cubby House’. In 1997 John Alexander Snr and John Alexander started restoring her. The following information has been provided by John Alexander in 2015. “I am not sure of the year she was built, her original name was the “Phyliss” a womans of course. Tim Phillips pointed us in her direction, we paid $1500 for a rotten hull, no centre case or transom or decks. So we made a plan and we had a shed built at our property in Whitehall Road to renovate her starting in September 1997 ready for a launch, Australia day 1998. A four month program. My father, John Alexander Snr, was by then 65 years of age. He did his time after the war in Smiths Dock, Newcastle upon Tyne as a shipwright and later became the youngest superintendent in the P&O shipping company. His Boat building skills were prolific as were his knowledge of timber and traditional ,materials. We advertised in the local centre link for labour and employed two long term unemployed people to work with my father to rebuild the boat, me helping whenever real work let me. 2. The deck would be 12 mm Marine ply with IROKO decking on top – this is lighter, and importantly makes a stiffer hull. 5. New transom from King William pine. 6. Mast as per any other Couta. 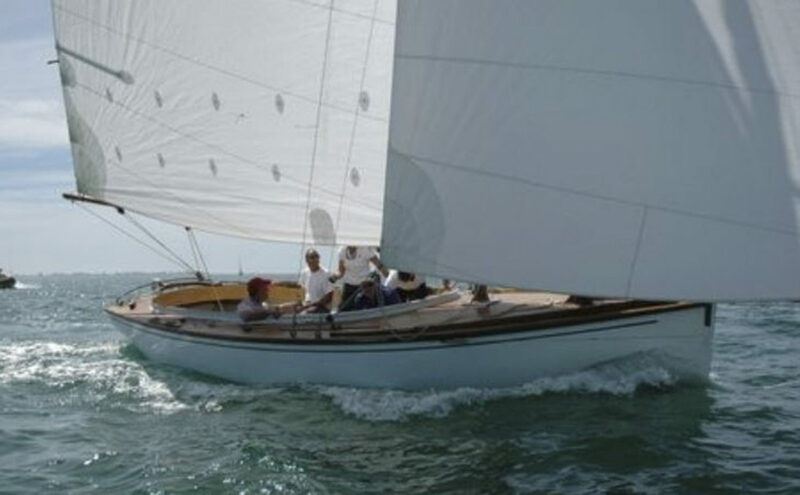 Scoundrel was launched on Australia Day 1998 and had a good racing record, at 25’ keeping up with and beating the larger boats, especially in lighter winds due to a large sail area for her size and light construction. Scoundrel had a mostly female crew as they presented much better company, on the eye and always had good sandwiches. The crew from this Scoundrel still race together all over the World doing offshore racing and generated long friendships that endure.